Google AdWords has recently released a statement saying that starting in June 2015 it will be requiring verification of ownership for all call extension and location extension phone numbers. In order to verify phone numbers associated with ads, brands will have to prove that the numbers are associated with the business that is promoted in the ads. 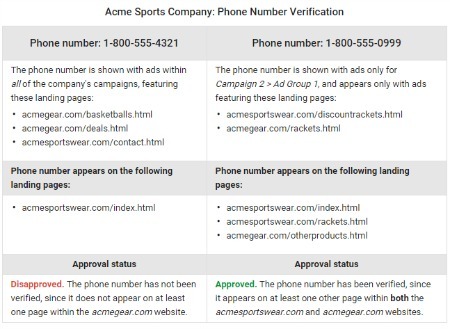 Google states that phone numbers which require verification will appear with an “Unverified” or “Unverified phone” notation on the Ad extensions tab. There are three methods which brands can use to verify their phone numbers. The first way brands can verify their phone numbers is to ensure that the phone number used in their extension is present on the website featured in its ad. If the phone number is associated with multiple ads featuring landing pages for different websites the phone number must appear in text on at least on page for each unique website. The second way to verify phone numbers is to link the brand's Google Webmaster Tools and AdWords accounts together. Finally, brands can also verify their phone numbers by adding their unique AdWords conversion tracking code snippet to the landing page featured in their ad.